Count Basie held onto his band through the 1950s because he didn't hold on tight. Rather than insist that musicians play only with him, Basie let them record as leaders or behind other artists whenever the band had extended time off. As a result, virtually all of his bandmembers recorded alone and together during the '50s and early '60s. 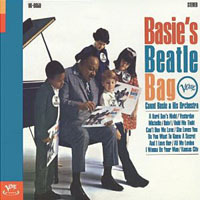 One of the groups that splintered off from the band to record was known commercially as The Basie-ites. This ad-hoc ensemble recorded two albums—one accompanying singer Beverly Kenney in 1956 and the other with pianist Barry Harris on piano in 1960. Both are interesting albums for different reasons. In 1956, Kenney recorded Beverly Kenney Sings with Jimmy Jones and the Basie-ites for Roost. The band featured Beverly Kenney (vcl), Joe Newman (tp), Frank Wess (ts,fl), Jimmy Jones (p,arr), Freddie Green (g), Eddie Jones (b) and Jo Jones (d). It was her third and final album for Roost before moving on to Decca. Her voice is absolutely gorgeous, with Newman's muted trumpet playing behind her and Wess's commanding but eel-y tenor saxophone soloing. Interesting how Jones arranged Old Buttermilk Sky to open with the same introduction Miles Davis used on Walkin' two years earlier. Other gems include Nobody Else But Me, A Fine Romance, Who Cares What People Say, Isn't It a Lovely Day, My Kind of Love and Makin' Whoopie. Kenney's voice had a joyous woman-child innocence, and she always made interesting on-the-fly jazz note choices. I wish someone reported the story of her emotional decline and why she attempted suicide several times before succeeding in 1960. Meds for depression today simply didn't exist then, leaving people with mental illness to fend for themselves, often with disastrous results. Knowing Kenney's fate four years later brings a special urgency to her rendition here of Can't Get Out of This Mood. How High the Moon works splendidly, with a terrific bop solo by Harris and then each member of the band. Poor Butterfly and Stairway to the Stars feature powerful trumpet solos by Joe Newman, the latter with a mute and a solo by Harris. Al Grey solos on When I Think About Lovin' You, doing so with an It's Easy to Remember (And So Hard to Forget) feel. Newman is back on My Old Flame and Gray returns on September Song. Sometimes I Feel Like a Motherless Child once again belongs to Newman and Gray is on Blue Moon, with Harris adding yet another tasty bop solo. Newman and Gray play so beautifully throughout that the album has a vocal feel. Of course, many more Basie-band configurations flourished in the 1950s and early '60s. They just didn't call themselves the Basie-ites. For example, on Sarah Vaughn's After Hours at the London House, the signer was backed by a Basie-band ensemble. 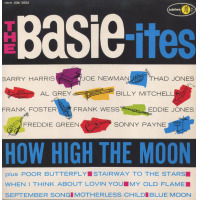 For fun, someone should create a list of all the Basie-ite sessions, whether they went by that name or not.